. (1389). منزلت عقل از مَنْظَرِ قرآن. عقل و دین, 1(2), 57-97.
. "منزلت عقل از مَنْظَرِ قرآن". 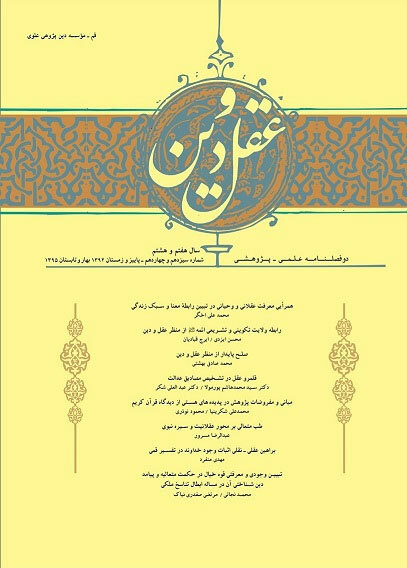 عقل و دین, 1, 2, 1389, 57-97.
. (1389). 'منزلت عقل از مَنْظَرِ قرآن', عقل و دین, 1(2), pp. 57-97.
. منزلت عقل از مَنْظَرِ قرآن. عقل و دین, 1389; 1(2): 57-97. دین مقدس اسلام بر خلاف همه مذهب‌ها و مسلک‌های اجتماعی موجود و گذشته مصرّاً پیروان خود را به تعقّل و خردورزی دعوت می‌کند و در بسیاری از آیات قرآن کریم به این حقیقت توجه شده است. از نظر قرآن کریم، نیروی عقل و خرد آدمی یکی از سرچشمه‌های علم و آگاهی بشر و نیز یکی از ممیزات واقعی انسان از سایر حیوانات می‌باشد. به همین علت، نقش عمده‌ای در ابعاد گوناگون شناخت حقیقی و در نتیجه رسیدن آدمی به حق و واقعیت دارد. در این مقاله در پی آنیم که پس از روشن شدن معانی عقل، با بهره مندی از آیات قرآنی و روایات به قدر میسور از ارزش این موهبت الهی و کارایی آن سخن بگوییم. Religion of Islam calls persistently his followers to reasoning contrary to other religions and social ideologies at present and past. In the many verses of Quran has been regarded to this fact. From viewpoint of Quran, the reason faculty of human is one of the sources of his science and knowledge, and also it is one of the factual distinctions of him from the other animals. For this reason, it has a very important role in the various aspects of true knowledge and consequently in attaining human to truth. In the essay, we follow, after explain the meanings of reason, that discuss about the valuable place of this divine blessing and its efficiencies by using from verses of Quran as far as possible. ـ باربور، ایان (1374)، علم و دین، ترجمه بهاء الدین خرمشاهی، تهران، مرکز نشر دانشگاهی، چاپ دوم. ـ راین، آلن (1382)، فلسفه علوم اجتماعى، ترجمه عبدالکریم سروش، تهران، صراط. ـ ریتزر، جرج (1379)، نظریه جامعه‌شناسى در دوران معاصر، ترجمه محسن ثلاثی، تهران، انتشارات علمی، چاپ چهارم. - Allport, Gordon (1962), The Individual and his Religion, New York, Macmillan. - Bauman, Zygmunt (2000), Liquid Modernity, Cambridge, UK: Polity. - Berger, P. and Huntington, S. (2002), Many globalizations: Cultural diversity in the contemporary world, New York, Oxford: Oxford University Press. - Bruce, Steve (2002), God Is Dead: Secularization in the West, Blackwell. - Bunting, Madeleine (1996), Shopping for God, the Guardian, 16 december, pp.2-3. - Casanova, J. (2006), Rethinking secularization, The Hedgehog Review, 8/1-2: 7-22. - Davie, Grace (2006), Is Europe an exceptional case?, The Hedgehog Review, 8/1-2: 23-34. - Dobbelaere, Karl (2002), Secularization: An Analysis at Three Levels, BernBrussels: Publishing Group Peter Lang. - Eisenstadt, Samuel Noah (ed.) (2002), Multiple modernities, Transaction publishers. - Heelas, Paul & Linda Woodhead & others (2005), The Spiritual Revolution, Why Religion is Giving Way to Spirituality, Blackwell. - Hobsbawm, Eric (1995), Age of Extremes, London, Abacus. - Hoyningen-Huene, Paul (1998), Kuhn,Thomas Samuel, in: Routledge Encyclopedia of Philosophy, Edward Craig (Ed. ), London, Routledge. - Inglehart, Ronald (1997), Modernization and Postmodernization, Cultural, Economic and Political Change in 43 Societies, PrincetonUniversity Press. - Kuhn, Thomas Samuel (1970), The Structure of Scientific Revolutions, second ed. enlarged, The University of Chicago Press. - Lasch, Christopher (1979), The Culture of Narcissism: American Life in an Age of Diminishing Expectations, New York, Norton. - Luckmann, Thomas (1990), Shrinking Transcendence, Expanding Religion? in: Sociological Analysis 50 (2), pp. 127-38. - Martin, David, (2005), On Secularization: towards a revised general theory, London: Ashgate. - Pettersson, Thorleif & Loek Halman (2006), A Decline of Religious Values? in: Globalization, Value Change and Generations, a Cross- National and Intergenerational Perspective, Peter Ester & Michael Braun & Perer Mohler (eds. ), Leiden, Brill. - Taylor, Charles (2002), Varieties of Religion Today, Cambridge, MA: HarvardUniversity Press. - Veroff, Joseph, Elizabeth, Douvan & Richard, Kulka (1981), The Inner American: A Self- Portrait from 1957 to 1976, New York, Basic Books.